The Book of Jeremiah, is part of the Hebrew Bible, and is also included in Christianity's Old Testament. It was originally written in a complex and poetic Hebrew, recording the words and events surrounding the life of the prophet Jeremiah, who lived in the late seventh and early sixth century B.C.E. in Jerusalem, during the fall of the Kingdom of Judah at the hands of Babylonia. Together with the books of Isaiah and Ezekiel, the Book of Jeremiah represents the highest point of the prophetic literature of ancient Israel. It is best known for its theme of the "New Covenant," in which a personal relationship with God will replace external observances such as temple sacrifice. It also emphasizes such themes as God's personal love for his people as both parent and a husband, the need for national and person repentance, and the importance of sincere religious faith rather than formal adherence to external ceremony. The book is also an important source of historical information about the period just prior to, during, and after the fall of Jerusalem to King Nebuchadnezzar II of Babylon, whom the Book of Jeremiah portrays at some points as "God's servant" rather than an enemy to be resisted. Several of the book's key concepts were later adopted by Jesus and the writers of the New Testament, the very name of which is an alternate translation of Jeremiah's New Covenant theme. 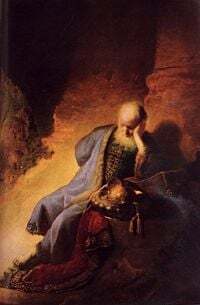 The prophet Jeremiah was a son of a priest from Anatoth in the land of Benjamin, who lived in the last decades of the Kingdom of Judah, culminating in the destruction of Solomon's Temple under King Nebuchadnezzar of Babylon. 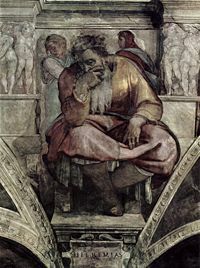 Jeremiah repeatedly issued prophecies predicting God's forthcoming judgment, advocating repentance in hopes of turning away God's wrath. He ultimately came to see King Nebuchadnezzar not as an enemy but as God's "servant" (25:9 etc. ), chosen to carry out divine judgment. He urged a policy of non-resistance to the Babylonians and urged the first wave of exiles to settle into their new lives and pray for the Babylonian king (29). To some, such acts constituted treason. Jeremiah was thus denounced by other prophets and priests, who believed God would deliver Judah if the nation fought back against Babylonian aggression. Jeremiah found himself banned from the Temple and imprisoned on more than one occasion. After the Babylonians put down a rebellion by King Zedekiah, Jeremiah was given special treatment by the invaders, while Zedekiah was blinded and taken captive to Babylon, and both the Temple and city of Jerusalem were destroyed. 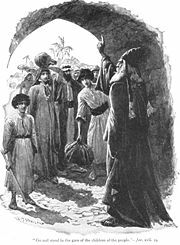 After a subsequent rebellion against the Gedaliah, whom the Babylonians had placed in charge of Judah, Jeremiah fled to Egypt and seems to have died in exile there. The Book of Jeremiah depicts a remarkably introspective prophet, struggling with and often overwhelmed by the role into which he has been thrust. More than any historical figure in the Bible, Jeremiah bears his soul to his readers. His self-portrait is not one of inner peace and harmony with the Divine. "Why is my pain unending and my wound grievous and incurable?" he complains to God. "Will you be to me like a deceptive brook, like a spring that fails?" Having surrendered to the divine will at an early age, Jeremiah apparently became a lifelong celibate at God's command, something unprecedented in the history of the prophets. He faced assassination plots from people in his own hometown, as well as official opposition that cost him his freedom several times and nearly cost him his life. In the end, Jeremiah would be known as one of the greatest of the prophets, whose sacrifices left an enduring legacy of hope for mankind. But in his own lifetime, it can only be concluded that his closeness to God brought him deepest sorrow and loneliness. Jeremiah prophesizes at one of Jerusalem's gates. It its current form, the book does not appear to follow a coherent chronological order, and many theories have developed concerning its authorship and textual history. The book itself refers to the scribe Baruch as writing down some of Jeremiah's prophecies verbatim, it is traditionally believed that Baruch is also responsible for the third-person narratives of the book. Scholars are agreed that many or most of the book's prophecies are genuine, but many are controversial, especially those contained in chapters 46–51. The book as it stands today is the product of a long process of editing and redaction. Possibly the most enduring theme of the Book of Jeremiah is the idea of a New Covenant. The book also describes God's love for his people in terms of the conjugal relations between man and wife: "I remember the devotion of your youth, how as a bride you loved me and followed me through the desert, through a land not sown" (2:2). "I am your husband," God declares to Israel, "'Return... I will frown on you no longer" (3:11-12). Michelangelo's Jeremiah on the ceiling of the Sistine Chapel. Thus for Book of Jeremiah, the "circumcision of the heart" is more important than the circumcision of the flesh (4:4). The prophet wrestled with God over the question of moral and social evil: "O Lord... I would speak with you about your justice. Why does the way of the wicked prosper? Why do all the faithless live at ease?" (12:1). He threatened kings with God's wrath if they did not administer justice properly (21:12) and demanded that the wealthy citizens of Judah liberate their slaves of Hebrew birth (43). Saint Jerome translated the Book of Jeremiah from Greek and Hebrew into Latin. Considerable differences have been noted in the transmission of the text between the Masoretic and Septuagint versions of the book. The Septuagint (Greek or 'LXX') version does not include 10:6-8; 25:14; 27:19-22; 29:16-20; 33:14-26; 39:4-13; 52:2, 3, 15, 28-30, etc. 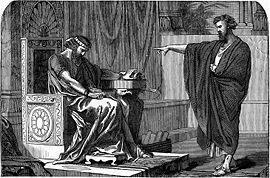 In all, about 2,700 words found in the Masoretic text are not found in the Septuagint. Also, the "Oracles against the Nations," that appear as chapters 46-51 in the Masoretic and most dependent versions, in the Septuagint are located right after 25:13, and in a different order. The Septuagint version also includes the Book of Baruch and the supposed Letter of Jeremiah. 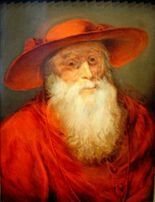 The great early translator Saint Jerome explained that his rational for not including these in his Latin version of the book was based on the fact that it was not accepted as scripture by the Jews. However, the Council of Trent later included them as part of the authorized apocrypha of the Old Testament. Parts of the Book of Jeremiah have also been found among the Dead Sea Scrolls in cave 4 in Qumran. These texts, in Hebrew, correspond sometimes with the Masoretic text and other times the Septuagint. The Book of Jeremiah strongly influenced the attitude and writings of the New Testament. Like Jeremiah, Jesus predicted that the Temple of Jerusalem would be made desolate if the rulers, priests, and people did not respond to God's call. Jesus even quoted Jeremiah 7:11 in his words to the moneychangers in the Temple courtyard, saying: "Is it not written, 'My house will be called a house of prayer for all nations'?" The earliest Christian writer, Saint Paul, speaks of the Christian ministry as fulfilling Jeremiah's prophecy of a New Covenant. Both Paul (I Cor. 11:25) and Luke (22:20) portray the Last Supper as initiating the New Covenant of Jesus' blood. Hebrews 8:7-8 directly quotes Jeremiah's own prophecy of the New Covenant as being fulfilled in Jesus. Indeed, the term "New Testament" itself is simply an alternate translation of the normal rendering Jeremiah's "New Covenant." Machinist, Peter. Prophets and Prophecy in the Ancient Near East. Atlanta, GA: Society of Biblical Literature, 2003. ISBN 158983027X. History of "Book of Jeremiah"
This page was last modified on 19 December 2016, at 16:23.